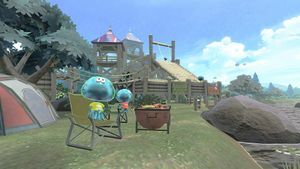 Camp Jellyfish is a campsite used by jellyfish that can be seen across the lake on both sides of Camp Triggerfish. It cannot be physically accessed in-game. Camp Jellyfish is located in a heavily wooded area surrounded by a large mountain range. It is similar in appearance to Camp Triggerfish, consisting mainly of a large wooden fort. However, it also includes a dock, multiple canoes, and tents displaying images of ink splatters with eyes. Jellyfish can be seen here performing various actions, such as jumping in a canoe, sitting by the lake, and climbing on the fort. Parachuters can sometimes be seen over Camp Triggerfish and, by extension, Camp Jellyfish. It is possible that they are jellyfish who have come to enjoy the camp. Another view of Camp Jellyfish. A zoomed-in view of part of Camp Jellyfish, showing one jellyfish in a boat and another on a dock. Parachuters over Camp Triggerfish, possible patrons of Camp Jellyfish. A jellyfish waving at Camp Triggerfish. A jellyfish looking at the water. This page was last edited on 28 March 2019, at 20:00.